This year, as I built sand castles with my 19-month-old, I started to think about the make-up of the beach. 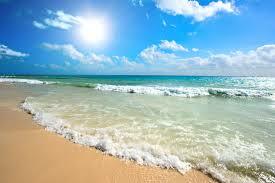 I'm from South Florida and went to Florida State University, so I've been on a lot of beaches in the Southeast. As a regular beach goer, you get a chance to understand something about beautiful beaches: they are a construction project not a natural wonder. This is the first image that pops up on my google search of "beach"
What do I mean by this? It is easy for tourists to take for granted that beaches are a form of "natural" beauty. But if you hang out at the beach long enough, you'll see a set of technologies that don't bring to mind the breezy palm tree filled calendar shots we associate with the shore. Instead, they offer a glimpse of the modern beach as construction site: heavy dredging boats, ugly pipe lines, and unsightly machinery. I've never seen a beach calendar called "tractors and tans" but it would be a little truer to life. The practice of building up shorelines, commonly called beach nourishment, is done to replace eroded sand or to widen shorelines. Erosion of the shoreline occurs continuously- either slowly through day-to-day tidal erosion or more quickly due to large storm surges. While erosion is naturally occurring, man made structures can often disrupt the natural buildup of sand on beaches. For instance, in Cape Canaveral, FL, a jetty was lengthened in 1995 above the port entry in order to stop sand from re entering the dredged channel over time. This helped keep the newly dredged channel clear of sand, allowing cruise ships access to the port and making it easier to maintain water depth in that area. While this solved one problem, it created another. Sand usually flows southward in this region along the shoreline; basically, constant erosion of Northern beaches was replacing sand eroded on Southern beaches. However, the jetty blocked that replacement pattern, denying southerly beaches an estimated 156,000 cubic yards of sand a year. There are several reasons why shrinking beaches are a problem. 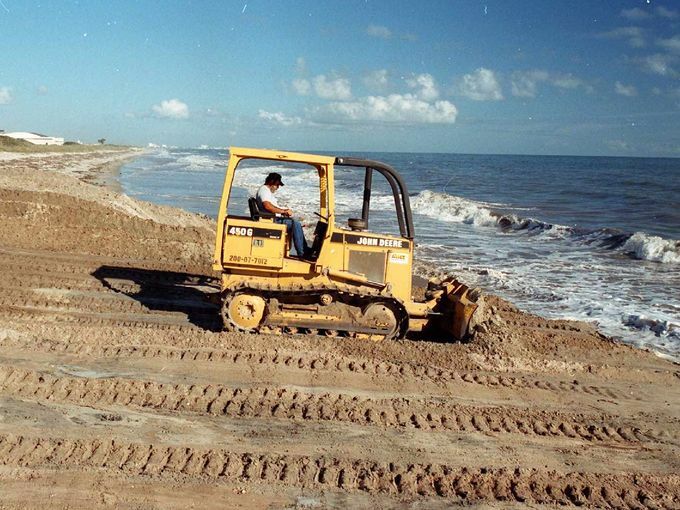 Sand protects shorelines from storm surge. Giving the ocean more shoreline to "chew" on means less damage to coastal ecosytems and property during major storm surges. In addition, it sustains populations of animals who nest in these areas. Sea turtles, crabs, shore birds: all of these animals require a beach on which to build their nests. * And finally, of course, humans like to live and visit the beach. Some studies have shown that beach nourishment has a positive impact on the tourism economy (Klein and Osleeb, Journal of Coastal Research 2010) and that oceanfront property values could drop between 17- 34% if nourishment programs were decreased or eliminated (McNamara et al PLOS One 2015). *there's a caveat about sea turtles here and I'll talk about that in my next blog post about environmental questions about the process- dredging isn't always great for wildlife. The first beach nourishment project was the construction and expansion of the shoreline off of Coney Island and Brighton Beach. At the turn of the twentieth century, salt water bathing and visiting the shore became a popular health cure. The combination of sun and sand was thought to cure a variety of diseases arising from the constriction of humans into dank, dark, and polluted urban spaces. As more and more people flocked to cities like New York and Philadelphia, more diseases arose including rickets, tuberculosis, whooping cough, and pellagra. And all of these illnesses were believed to be cured or at least alleviated by exposure to salt and sun. If you want to know more about this history see "They Can't Help Getting Well Here":Seaside Hospitals for Children in the United States, 1872-1917 by Crnic and Connolly in The Journal of the History of Childhood and Youth (2009) or Crnic's dissertation from the University of Pennsylvania (2013) Seeking the Salubrious Sea. 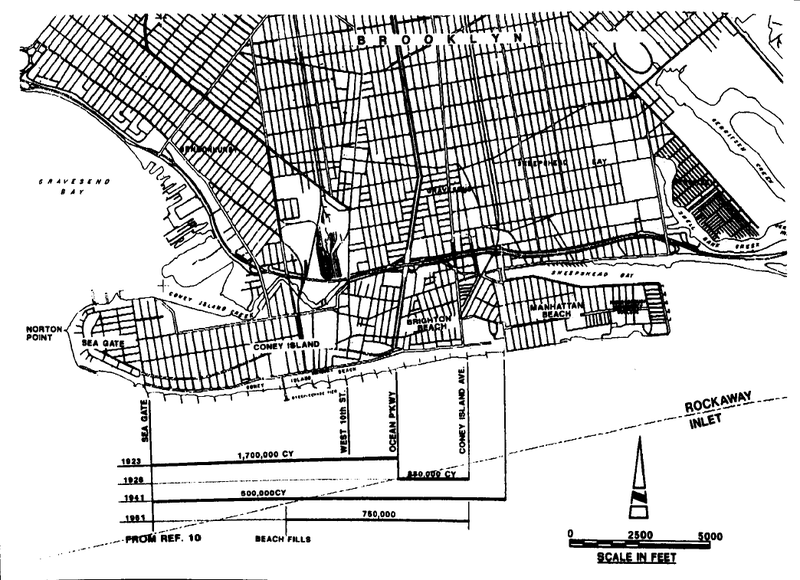 The city of New York developed plans to build a bathing beach and pier at the turn of the twentieth century, but it took almost 20 years to work out the legalities of transferring ownership of the beachfront property from private landowners to the city. It was complicated by the fact that many of these landowners were loath to give up their shore front property because they charged beachgoers to sunbath. 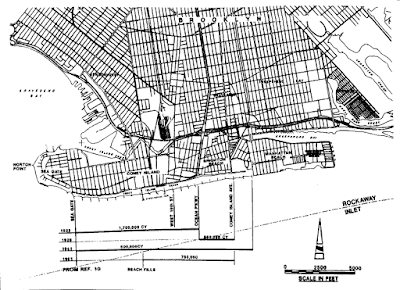 By October 1921 the city of New York passed legislation allowing them to transfer titles for beachfront property in the same manner that property was acquired for public road projects. The shoreline along these areas was sparse and eroding slowly; high tide reached the base of the buildings built along the water. This meant that an enormous amount of sand needed to be relocated to construct both a bathing beach and a pier. As you can see from the image above, improvement of the beach continued throughout the first half of the twentieth century and maintenance continues today. Fill from borrow areas is required every three to four years to maintain the beachfront. 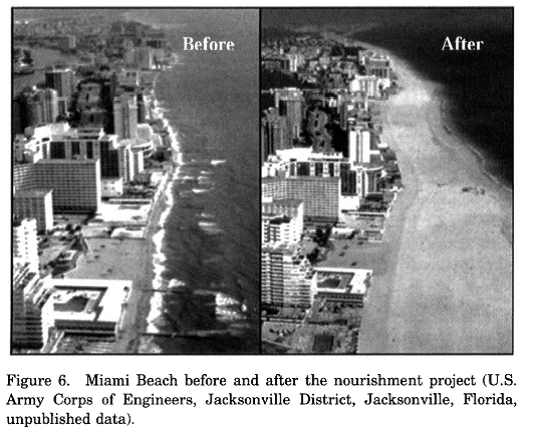 While there has been some theorizing that beach fill would eventually lead to a stable shoreline and negligible loss of sand mass on filled beaches (related to depth of closure- something I'll talk about more in my next blog), most beach nourishment projects require continuous upkeep. Brevard County, Florida where Cape Canaveral resides, has an amazing website detailing the history of their beach nourishment programs (They call it beach restoration). It tells the history of those projects from 1995 to the present day and is pretty cool. Seeing the differences in shorelines is pretty amazing so I've included two below- Cocoa Beach (2001 project) and Miami Beach (1981). While many beaches need nourishing, Florida is where most federal money for nourishment goes. The 1981 nourishment of Miami Beach involved depositing 12 million cubic yards of sand on the shoreline.